As the designer of cars like the Aston Martin DB9 and BMW Z8, Henrik Fisker proved his creative skills. Now the Danish-born businessman has shown his entrepreneurial talent by raising $1 billion to launch a company to build stylish sports cars that are also environmentally friendly. Fisker's Karma plug-in electric car, which is currently hitting showrooms in Europe and the U.S., is the first stage in the designer's professed goal "to redefine the luxury automobile with an unwavering dedication to sustainability." The four-door Karma can run on battery power for 80km and for 483km when the lithium ion battery pack is charged by a 2.0-liter, four-cylinder engine driving an electric generator. The car has a top speed of 200kph, but average fuel consumption of just 2.4l/100km and CO2 emissions of 83g/km. Fisker believes his firm will succeed because he isn't spending huge sums to establish new factories. The Karma is produced by Valmet Automotive in Finland. Fisker's Nina model will be built in a former General Motors plant in Delaware in the United States, helped by a $529 million government loan. After 12 years working as a designer for BMW, Fisker joined Ford Motor Co. in 2001 where he served Aston Martin's design director, later becoming director of Ford's global advanced design studio. 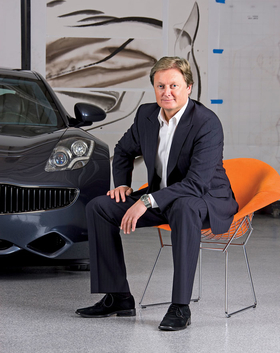 In 2005, Fisker left Ford to start a company making tailor-made cars based on production cars with partner Bernhard Koehler, a German-born former BMW and Ford designer. Two years later the pair founded Fisker Automotive.